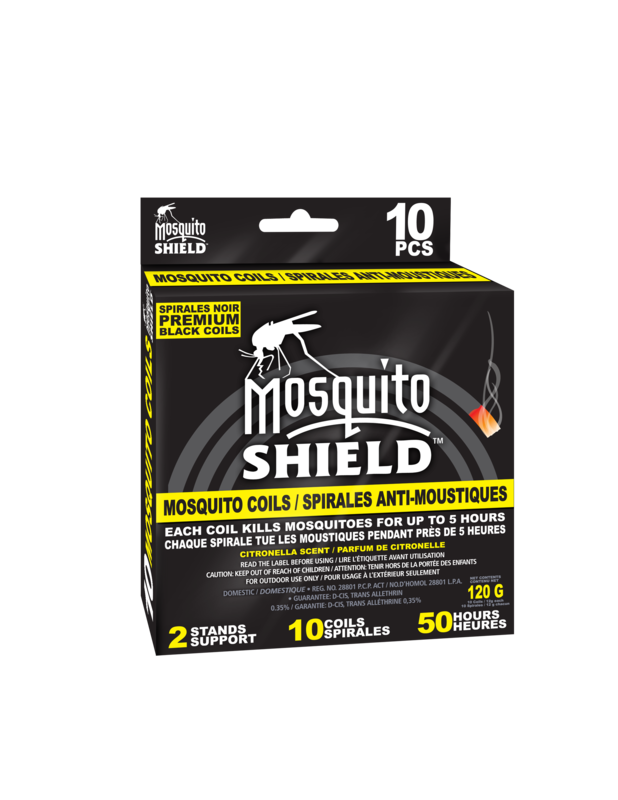 MS0401 – MOSQUITO SHIELD™ MOSQUITO COILS -BOX – KUUS Inc.
Use the Mosquito Shield mosquito coils to create an invisible SHIELD to protect you from mosquitoes while enjoying the scent of citronella, which provides protection against damage to the coils and can be flipped upside down to be used as an ashtray for the burning coil. Ideal for camping, cottagers, porches, patios, gazebos, decks and backyards. 5 hour duration per coil. 10 coils (12 grams each). May be used in outdoor areas like porches, covered patios and similar areas where there is little movement of air. Place 3-4 coils about 3 meters apart around area to be protected. 1 coil per 30 cu. meters. Bend the centre of the metal stand to upright position. Insert the slot of the coil into the top of the stand. Light outer end of the coil with a match. Blow flame out once sustained glow is obtained. A broken piece may be used by inserting it into the open gap of the metal stand.